Hello, I am a dad of twin girls that I fondly call "obuls". This blog will contain musings of Obuls Daddy on a variety of topics. Some tips, some information, some experience being shared, but never intended as advice or recommendation specific to your situation. Some tid-bits from my Japan business and tourist experience below. Getting around - Airport to Hotel: Tokyo or Osaka are the main cities that one might fly in, and in both cases, the airport is quite far from the city - takes about 1.5 hours. I have used two options, the limo bus and express train. There is a counter at the airport to get the tickets for limo bus. They may accept credit card, but it is a good idea to get some Yen cash at the airport currency exchange counter as cash is the norm in many places. One can quickly notice extra hands (double checking cashiers, queue usherers, elevator operators) doing little help that may not be absolutely needed, but that's Japan's way of employing everybody. . Train Rides: Trains are a popular and efficient mode of transport in Japan, very clean and punctual. After a couple of trips, I could find my way to the train (much of the directions are in Japanese, though airport and railway stations have some English). From Osaka, I took Kansai express (called Haruka express from Kansai International Airport to Shin-Osaka)that goes to Shin-Osaka (New-Osaka). First, I asked tickets for Osaka, and they assumed the old town, and confused me with hopping two trains - I knew that wasn't needed, and corrected myself. There is also bullet train from Osaka to Tokyo called the Shin-kan-sen (New truck line). The ride goes through historic towns of Nagoya, Kyoto, Tennoji and gives an impressive rustic view of Japan. From Tokyo, it is Narita express, and that takes us to the Tokyo Central Station. Taxi Rides: Once I reached the city railway stations, I took a cab to the hotel (I think I paid around 1000 yen or about USD 10) . I stayed at the Imperial Hotel in both Osaka and Tokyo, and it was important to say "Teikoku Hotel", since the cab drivers don't understand the english name. Cab drivers are honest and impeccably dressed, mostly in suit and gloves, though it can be difficult to communicate since most can only speak and understand Japanese. Some Japanese taxis have a mobile broadcast TV, so it is possible to watch local channels during the ride. Imperial Hotel: True to its name, staying at the Imperial has always been a royal, safe a nd pleasant experience. 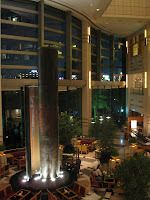 The hotel has an impressive ambience, and 5-star service, and is located ideally. In Tokyo, it is across the Imperial palace and right next to Ginza (the equivalent of New York Times Square). In Osaka, it is right next to a river offering nice views from the room, and next to the Osaka Amenity or Business Park (OAP) that provides a nice ambience and places to shop and eat. I usually have a good breakfast (buffet) at the Imperial, so I wont have to worry about what I get for lunch while I am out hunting. It is good to pick up some Japanese vocabulary that may help break the ice. At a minimum, Konichiwa (Hello), Ohio Gozaimus (Good Morning). Ari-gatho (Thank you). And, Ici, Ni, San is 1, 2, 3. (the last one is from "Big Bird in Japan"!). When I saw "Sanwa bank", it occurred to me that it is "Third Bank". I heard someone say "Neon", and that actually meant 24 (Ni On). When introducing yourself, it is important to hand over the business card with both hands. Likewise, receive the other person's business card with both hands. Make sure you take a good look at their business card, and not just put it in your pocket. You can say "Hajme Mashte", or just "Pleased to meet you", and speak your name and your title or responsibility slowly and clearly. Bow! Bow! Bow! The more you bend, the more you respect, but don't overdo it or make it too obvious. Even in stores or other places, it is good practice to use both hands for giving out or receiving credit cards or even cash. Once discussions start, you may notice there may be a dozen people in the room, but only one person speaks. Others will only chime in if this person makes a request. They may be silent and speak only in Japanese, but many of them understand English, so if we speak slowly and clearly, they will understand. Usually, there is an interpreter and things get lost in translation, so it is important to pay extra attention to make sure the right, unambiguous messages are conveyed. Generally, it is also easy to tell the hierarchy from the attire. The director or senior manager wearing a suit, followed by the manager wearing a tie, and the engineer with no tie or suit. It is better to dress in suit when soliciting business. When I take my engineers along, I remind them before their flight to bring their suit as well (or just tie and blazer - doesn't have to be a formal suit). Japanese tend to work longer hours, way into the evenings and night. Thus, it is OK for employees to sleep in meetings! They understand the guy or girl is just tired! This may come as surprise for some of us int he US, where sleeping at work can get you out the door for good. In Japan, people smoke quite a bit, and there is also a lot of booze (from Asahi beer to shochu or sake shots). I was also surprised to note it was an open society - a friend of mine said infidenlity runs as high as 70% in Japan. I have answered a lot of inquisitive questions on my age, marital status even on a first meeting, but my friend tells me that could just be curiosity with no further intent. Japanese people gesture with kind of prodding with the palm facing upward, which I have found unique and enjoyable. 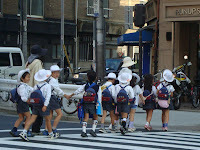 Going around: Again, I can only provide a pinch of flavor here - it is possible to write a book on Japan tourism and culture. The Imperial hotel has bus tours with english speaking drivers/guides, to take you around Tokyo, Mt. Fuji, or in the case of Osaka, to the historic town of Kyoto. I have taken the Tokyo bus tour and my friends took a private car ride to Kyoto from Osaka, and it was a safe and fulfilling experience. 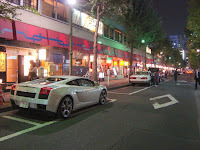 In Tokyo, I have hanged out in Ginza area right behind the Imperial hotel. There are innumerable shops, places to eat, some of them interestingly built under the overhead freeways, railway tracks , providing employment to so many common people. My friend tells me Ginza is like Las Vegas on steroids! One thing to watch out, the restaurants vary dramatically in prices - I have spent less than $10 all the way to $80 on sushi per person. Some places are so good, that people wait 2 hours in line just to get in! 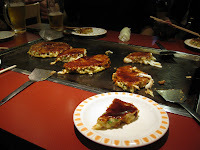 Other than sushi, there are also good places for Okonomiyaki, Tapan Yaki and of course, Thai, Italian and Indian restaurants in the Ginza area. I can't reproduce the Japanese names of the restaurants, and addresses are somewhat complex in Japan as well - goes by block and building names, as opposed to streets and n umbers. 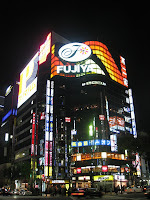 For shopping, BiCamera is a good store to visit in Tokyo, near Ginza - it has several floors of electronic and household goods, somewhat like Frys in the US. It is also easy to walk to the Imperial Palace sprawling lawns diagonally across the Imperial hotel. We can't go in, but can take good pictures of the palace from outside. The Tokyo bus tour takes us to the Tokyo TV tower, where we can get half way to the top, and see pretty much all of Tokyo - a concrete jungle, and a glimpse of Mount Fuji. It also takes us to Asakusa, which has a Buddhist temple, and adjoining shops where one can get nice little gifts and mementos. You can also get a similar or better experience in Kyoto.